The Denver Nuggets are off to their best start in franchise history. They have a record of 37-16 and they have done so with only fielding their opening night starting unit twice all season. 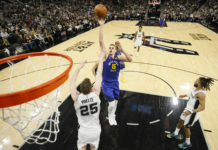 Despite being the most injured team in the NBA — and also one of the youngest — the Nuggets currently occupy the second seed in the Western Conference with only half of a game separating them from the conference-leading Golden State Warriors. After missing out on the postseason by one game each of the last two seasons, the Nuggets have approached this season like a team on a mission. Denver is so hungry for success that they have played like a team possessed this season regardless of whatever obstacles are standing between them and their goals. 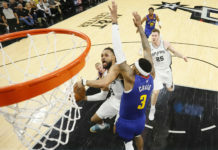 They will not be stopped until they accomplish their mission of being a playoff team and they are treating every game as if a loss could lead to them missing the postseason once again as it did in the past two seasons. Motivation like that is what drives this Nuggets basketball team and it is why the franchise should feel no pressure to make any new additions as the trade deadline comes and goes. Could the Nuggets use a sharpshooter off the bench like Wayne Ellington or a ‘three-and-D’ player like Wes Matthews? Absolutely. But is its a necessity? Not at all. Tim Connelly, the Nuggets president of basketball operations, did such a phenomenal job of finding, acquiring, and developing young players that Denver’s best course of action may be to sit out of the trade deadline festivities and stick with the roster they have already constructed. Whether it was trading the 11th pick in the 2014 draft — which turned into Doug McDermott — to the Bulls for Jusuf Nurkic and Gary Harris, the 16th and 19th picks respectively, or finding such a transcendent talent in Nikola Jokic with the 41st pick of the same draft, the Nuggets have been pulling the right strings for awhile now. Because of their mastery in roster construction through the draft, Denver’s best path forward may be just be staying on the path and not deviating. In a league built on superstars and the forming of super teams, the Nuggets are not equipped to build their team in this way. Most of their roster consists of home-grown talent; Denver has truly built their team from the ground up. 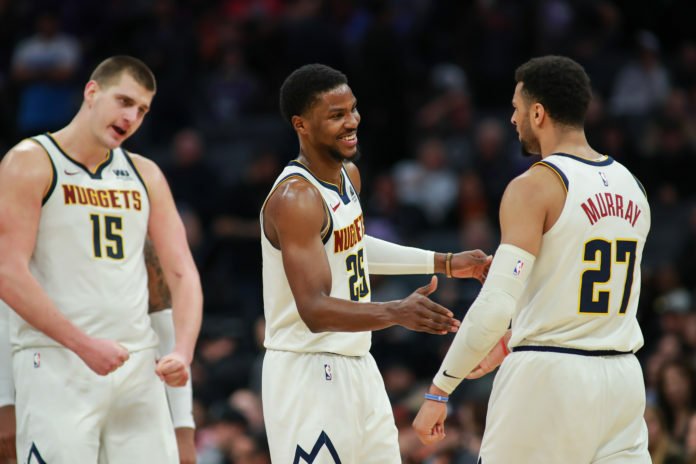 There is no doubt how tight-knit of a group that the Nuggets have in that locker room which — if you ask Nuggets head coach Michael Malone — is a large reason for all of the success they have had so far this season. Whether it is a big time win against the Houston Rockets or a small victory against the Cleveland Cavaliers, this Nuggets team does not bat an eye. They approach every game as if they can and will come away victorious, which they have done in nearly 70 percent of their games so far this year. Still, only one goal is in mind, and that is to end a five-year drought and make it back to the postseason. With the emergence of players like Monte Morris, Malik Beasley, and the potential return of Isaiah Thomas in the near future, there is no need to make a move now. There was no telling what type for production that Denver was going to get from either of Morris or Beasley before the season started, but both of them have already blown away their expectations for the year. While bringing in more talent could help, there is also the issue of taking minutes from the likes of Morris and Beasley, who have without a doubt been X-factors all year for Denver as the team has risen up the ranks of the Western Conference. The Nuggets have also have even more talent on the end of their bench; players that have barely set foot in an NBA game. Denver still has Michael Porter Jr., who is continuing to rehab from offseason back surgery, and Jarred Vanderbilt, who is working on his game in the G-League, as two unknowns on Denver’s roster. Both Vanderbilt and Porter Jr. have an absurd amount of talent, and have not even scratched the surface yet. Right now, each of them could be more valuable to the Nuggets as long-term projects than as trade sweeteners in a deal prior to the trade deadline in Thursday. 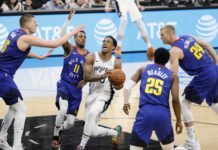 With nearly every player on the Nuggets roster taking steps forward in their development, maybe the best course of action is to continue developing from within as opposed to trading one of their young assets. Last year, the Nuggets main issue was their backup point guard, so they sent the struggling Emmanuel Mudiay to the Knicks in a three-team deal that netted Denver Devin Harris. That was a no brainer of a deal, but there is not one particular glaring for Denver to address at this point. Because of all of these reasons, it may be a fools errand for Denver to potentially mortgage their future for a one-year rental of a player like Anthony Davis. Denver may look to find more shooters or another big during the trade deadline — players like Robin Lopez or Terrance Ross — but Denver should not feel a need to force a trade considering how strong their young core is already. Even with all of the injuries issues Denver has dealt with, they are still one of the best teams in the NBA right now which is also why they will be just fine if they do not make a move come Thursday afternoon.